"HELLO. who ARE you. 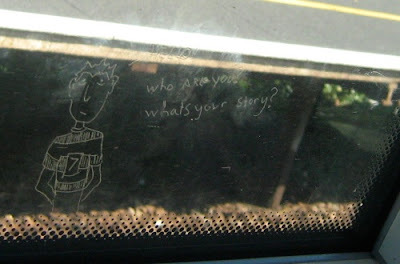 whats your story?" asks this piece of graffiti, spotted by my three-year-old daughter during a train trip from Broadstairs to Whitstable yesterday. Most graffiti consists of slogans, or names, declaring something. But this anonymous drawing turns it around and asks the viewer questions. Call me daft, but I found that, and the slightly forlorn looking cartoon character, oddly moving. I don't know if I want to think about what implements people are carrying with them that allows them to scratch drawings into train windows though. I actually quite like graffiti which engage with the environment, rather than just attacking it. I once saw "Hello Mr Postman. How are you today?" written quite carefully in indelible pen on a pillar box. Also, the village in which I live is called 'Catshill', and sometimes the letters 'L' get changed to 'T'. Dogpool Lane, Stirchley, Birmingham, frequently loses its last letter, too. Ha, yes, that sounds familiar. Poorhole Lane in Broadstairs often loses its "R". Apparently the name derives from mass graves used during the Black Death, but that's no reason not to engage in a bit of toilet humour, it seems.